When it comes to nature hiking, camping, practicing bush craft or hunting, having survival tools and weapons is a necessity. There is a huge variety of the best survival tools available on the market today. And plenty of reasons why you need to have a diverse range of them. The types and range that you do choose though will depend on your surroundings and your situation. So here's my top pick to get you started. Jahidul is an experienced traveler that is passionate about exploring different countries. He has traveled extensively throughout his life and passionate about this type of lifestyle. Together with his wife, he loves outdoor living and are both big fans of hiking. They know they are both fortunate to be able to travel the world and interact with various cultures and their way of living. The most common and basic tool you should have during a survival situation is a knife. It is the most potential survival tool because it can save your life in more ways than one. However, picking the best knife for survival can be tricky when there are many options available. While buying a knife you have to pay attention towards features like a thick blade, comfortable grip, and high-quality steel. When you are in jungle, you can use a knife in different ways. If you can learn the skill of throwing a knife towards your target, you can turn into a silent killer because your prey will never get a chance to run away. I'd recommend checking out this awesome 5-In-1 Survival Knife from BlizeTec today. You can easily turn your knife into a top survival weapon. Here are some of the common types of knives you should consider having. I highly recommended the Ka-Bar Kukri for its excellent functionality. Kukri knives really pay attention to the quality of the blade, with some of their most famous being the tanto blade and seax. They are historical but still the best. Don’t forget to include a pocket knife sharpener if you are planning on depending that also and going for long outdoor adventures. For everyday survival, another necessity you will need is having a hatchet in your survival weapon collection. You can use it in different ways like. Some hatchets come with a blunt flat back that you can use for driving steaks. You can also use it for cutting think steak posts that you can use for setting up your tent. If you are wanting to prepare for a primitive survival situation, it is important to have a hatchet with you. While buying the hatchet you should pay attention to the quality blade and weight of product. They can be heavy because of their huge size. Get the hatchet that is comfortable for you to carry and you can easily use in case of survival. I recommend this Outdoor Camp Axe & Survival Hatchet as apart of anyones kit. Get over the fact that you don’t like guns if you want to survive in the woods. Having a lightweight rifle or high-powered handgun is perfect for self-defense. It can protect you from large predators and many other threats that might occur in the jungle. When you are planning to carry a firearm, don’t forget to add a sufficient amount of ammo in your water-resistant bag. If you know how to make ammo, the problem is resolved. If you are planning to go on a hunting trip, ensure that your rifle is lightweight with an accurate scope. There are some products available that come with a noise cancellation device. The gunshot noise produced by a rifle will be controlled and your prey won’t be able to hear you. It is better that you get your license for having a gun otherwise you can get caught for having an illegal weapon. Always buy your firearms from reliable retailers and certified shops. Having a small gun that can easily fit in your pocket is a better option for camping or a hiking trip. You need to select the weapon you would like to carry according to the type of trip you are going on. Having a Machete as one of your best survival tools and a part of your survival weapon collection is more important than you can imagine. It has multiple uses and provides a solid defense if a predator tries to attack you. Machetes commonly have a longer blade as compared to knives and they are specially designed to make paths by clearing bushes or attack an animal with claws from a distance. Machetes look very intimidating compared to smaller knives, however it can be a little heavy. I recommend the SOG SOOGfari 18 inc Machete. The best thing about bows is that they are silent and deadly. The arrow of a bow is designed with such perfection that it will not make a single sound and kill your prey. Without alerting others about your position, you can easily get more than two shots in. There are different types of bows and crossbows available. If you have the skill of using a sing traditional bow and arrow, it is a better option. Lightweight and easy to carry will make it your perfect survival tool. 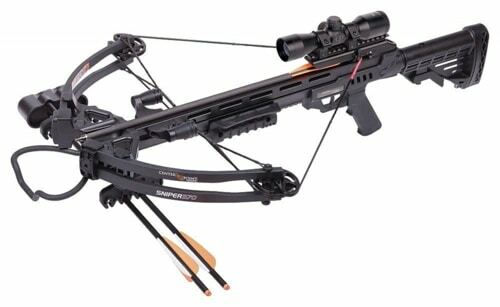 On the other hand, if you don’t have the skill of using bows, there are crossbows available, such as this great hunting CentrePoint Sniper 370 Crossbow. Select the survival tools and weapons you are most comfortable with. Carrying all of them might get tough because it will increase the weight of your gear. However, the weapon you must have in all situations is a knife. Apart from a knife, you can always buy any of the survival weapons mentioned above. But ensure that you know exactly how to use them. And lastly, definitely compare different products available on the market before you buy.